Last year, after my 56th birthday, I began to understand what the phrase, “feeling your age,” actually entails. What caught me by surprise, however, is how it looks. Aging is sly the way it sneaks up on you. There are no bulletins to announce its arrival. It suddenly appears when you aren’t paying attention. Looking in the mirror one day, you wonder whose face is staring back. Personally, I never saw it coming. In my late 20s, I was still carded at the grocery store when buying alcohol. I found it amusing. Little did I realize that in just over a decade, my face would be framed by gray hairs with a mind of their own. Pimples are replaced with age spots. The corners of my eyes are now home to more laugh lines than heard in a comedy club. Makes me wonder if I hadn’t had such a good time up to this point, would I still look 25? Now don’t get me wrong, I have nothing against aging. After all, consider the alternative. It’s just that I thought I would do it better. Take yesterday, for instance. 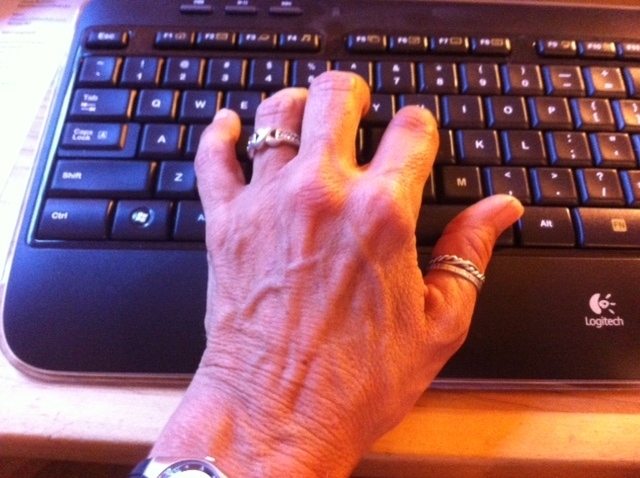 I was typing at my computer when I gazed down to catch a glimpse of something from the reptilian family move across my keyboard. Thinking my cat Oliver (as generous as he is) brought me another lizard, my heart skipped a beat. False alarm. The lizard was my hand; a rather wrinkled, veiny looking hand, at that. 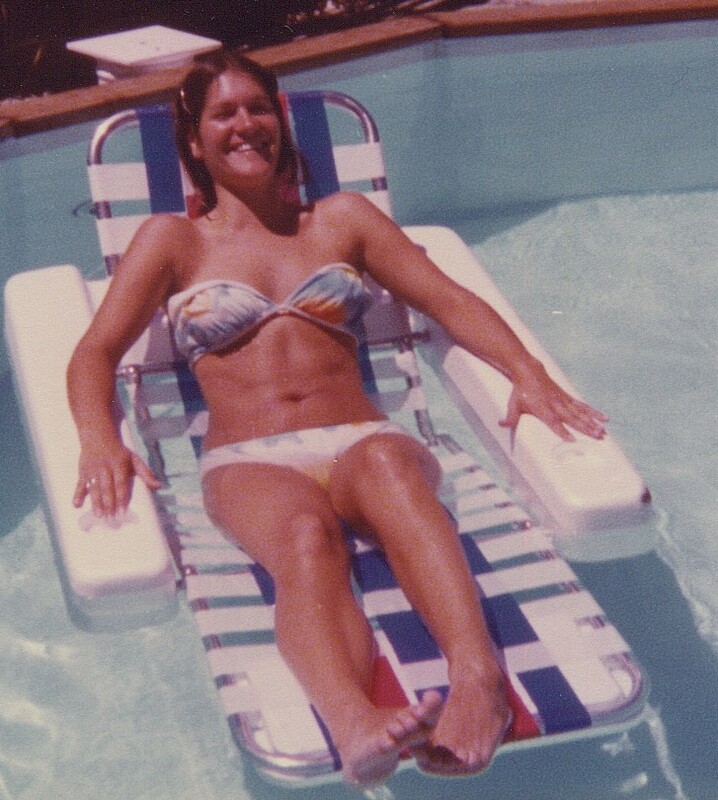 When I was in high school, before we realized the sun was not our friend, my cohorts and I drenched ourselves in baby oil and then baked poolside. Our only concern was that our bikinis might shield too many rays. Since childhood, I had a deep tan from June through September. It was like an extra appendage that was attached to me four months of the year. I felt incomplete when it was gone. But then the ozone got that big hole and the next thing we knew, ultra-violet rays were public enemy number one. So 25 years ago I threw away my baby oil, bought silly looking sun hats, and purchased sunscreen with enough SPFs to keep me looking albino. But it was too late. All those warnings my mother gave me, which naturally I ignored, have returned to haunt me. Somehow, she refrained from saying, “I told you so,” when I complained my face no longer possessed a stitch of collagen. Aging, however, isn’t entirely the sun’s fault. Some things are inevitable, like aches, pains and gravity. Even though I play tennis, jog and lift weights, when I hit 40 I woke up with someone else’s body. Many mornings I hobble from bed feeling like the Tin Man who discovers his oil can is empty. Also, things don’t seem to be in the same place they were before; the girls (my breasts), once content residing up north — are like retirees rapidly heading south. And if I wave, my triceps flap about like flags on a breezy day. So I don’t wave. Yes, I know that age is relative, and when I’m 80 I will look back on these complaints and realize how lucky I was. The harsh reality of aging is that my bikini days are over (hold the applause please). 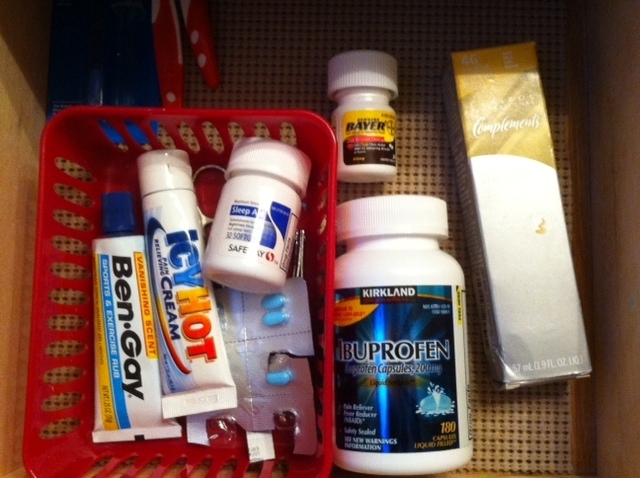 My bathroom drawer now contains a steady supply of brown hair dye and Ibuprofen. This entry was posted in Aging, Humor and tagged aging, boomers, getting old, humor, menopause, midlife. Bookmark the permalink. I cried on my 25th birthday. Now when I look back I see how ridiculous that was. The older I get, I may not resemble the old me but I feel young (most of the time!) so I guess that’s what’s most important. So do we look good for our age or are we kidding ourselves 😉 ? For me it depends on whether I’m wearing my glasses or not. Without them I think I look okay…can’t quite see the wrinkled neck and saggy skin!